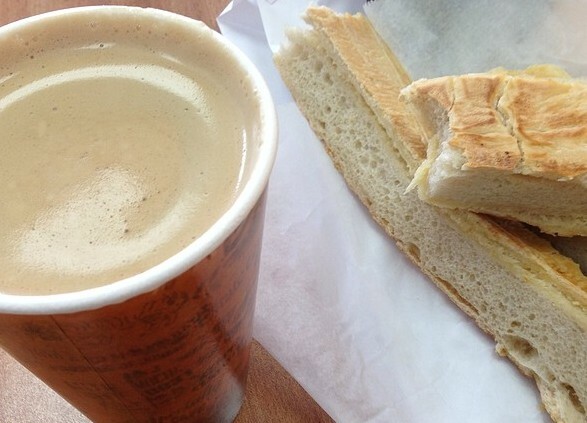 There is nothing like waking up on a Sunday morning and having the smell of fresh cuban bread and full-bodied cuban coffee waft towards you as you sleepily rub your eyes, crawl out of bed, and make your way to the kitchen. In a Cuban household, you don’t necessarily get to chug down an espresso cup of Cuban coffee as a child, but you can have a soothing cup of cafe con leche to start your day. As an adult, I have strived to make this frothy warm drink as good as my mother used to make and, although I have admitted defeat on a number of occasions, I can now make a delicious cup of cafe con leche that reminds me of childhood days and the soothing comforts of home. Now my Sundays begin with me in the kitchen and my son crawling out of bed to the smells of breakfast. My mom’s cafe con leche is still the best in my opinion, but my son absolutely loves it when I make it for him. What I have figured out throughout my coffee-making trials and tribulations is that cafe con leche is always better when someone else makes it for you and when that person makes it with love. So at this point, you have three choices: follow our steps to making the perfect cup of cafe con leche, show these steps to a loved one so they can make it for you, or stop by La Sorpresa Latina Cuban Cafe in Naples so our staff members can brew you a yummy cafe con leche. If you’re nice, they’ll definitely brew it with love. Fill the base of your stovetop espresso maker with just enough cold water to reach the little notch on the side. Place the filter at the top of the base and fill it with ground coffee. For a stronger coffee, pack the coffee grounds down to fit more in the filter. Screw the top of the espresso maker onto the base and place it on the stove over high heat. Once the water is heated, it will boil its way up the filter, through the coffee, and into the top cup portion of the espresso maker. While your Cuban coffee is brewing, warm your milk. You can do this by putting the cold milk in a small pot to slowly heat on medium heat before pouring it into a mug or you can fill a mug three-quarters of the way and heat it up for about a minute-and-a-half in the microwave. The milk will be hot when you are done, so be careful. Once the top cup is filled with espresso and you hear the coffee sputtering into it (about 5-10 minutes later), you know your coffee is done and you can it take it off the heat and set it aside. Grab a cup and pour the hot coffee into it. Then add sugar, or any sweetener of choice, to your liking. I like my cafe con leche dark and sweet so I tend to use a good amount of sugar. Finally, pour some of the coffee into your mug of milk. Start off with a little and keep adding until you reach your desired taste. If you like dark roast coffee, then you’ll probably end up with a 1:1 ratio. If you like a lighter coffee, then your ratio will be about 3:1. Stir the coffee and milk concoction and have it by itself or serve with toasted Cuban bread with butter. If you’d rather have someone make a delicious cup of cafe con leche for you, feel free to stop by La Sorpresa Latina Cuban Cafe. We are located at 8793 Tamiami Trl E # 101-102, Naples, FL 34113.